Lightly sketch out the ENTIRE face and the placement of features BEFORE you get into any detail. Many a great eye has been lost because the rest of the face wasn’t planned out before getting into detail. Use GUIDELINES – A LOT. Eye Line – 1/2 way between the top of the head and the bottom of the chin. There is about one eye width between your eyes. Your head is wide enough, ear to ear, to fit 5 eyes across. A good way to proportion your eyes before you draw them is to break the width of the head into fifths. The upper lid has a larger curve than the lower lid. The pupil has the brightest highlight on the face (eyes are always wet). The upper eyelashes are thicker than the lower. The moist lid has a thin highlight along its upper edge. Eyelashes begin in the corer of the lids and are thickest toward the outer curve. Nose Line (where the septum meets the upper lip) – 1/2 way between the eye line and the bottom of the chin. The width of your nose (wing to wing) is about the same as the space between your eyes. (One Eye Width). The darkest shadows are next to the apex – where it recedes into the eye sockets. Nostril openings face downward and should not be overstated. 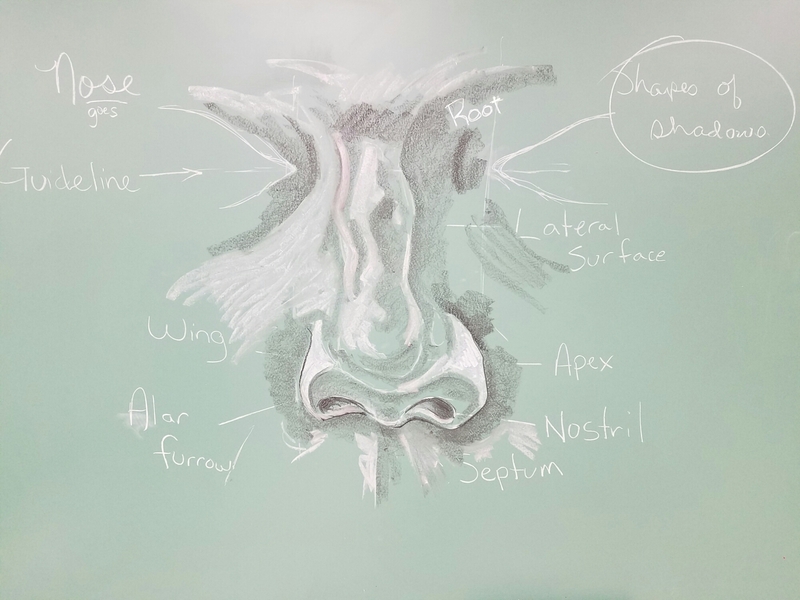 One third of the way up the nose, bone replaces cartilage and narrows to form the apex. The tip is spherical and is usually highlighted. 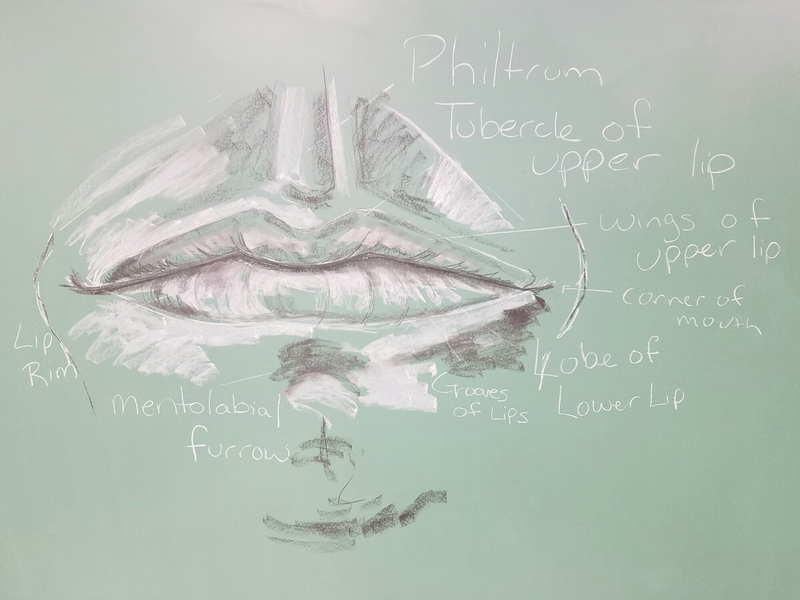 Mouth – 1/3 of the way between the nose line and the bottom of the chin. You can fit an eye width between the mouth and the bottom of your head all the way around. Your mouth is about as wide as the distance between your pupils. Take careful notice of the darkness and length of the center line of your mouth and lips. The center line should be one of the darkest parts of your face. The highlight is on the top part of the bottom lip and darkens as it curves over. The top lip tends to be in shadow. The upper lip tends to be longer than the bottom lip. Your mouth is formed over your teeth, it is not flat in the front. Ears – They fit in the space between your Eye Line and Nose Line. Cartilage around the ear forms a question mark outer fold with an inner fold curve. The opening of the inner ear is slightly lower than the center of the ear. 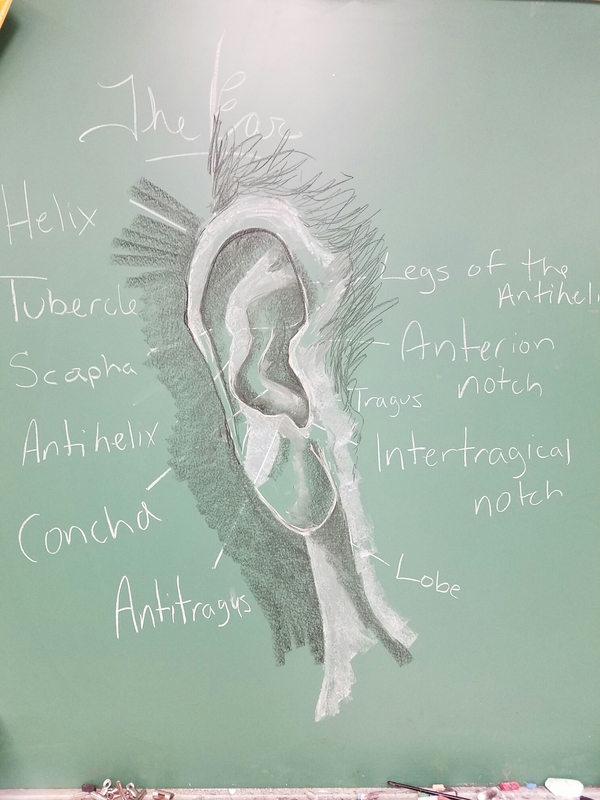 Earlobes lack cartilage and are flat. Hairline – 1/3 – 1/2 (varies) of the way between the top of the head and the eye line. Neck Width – about the width of the outside corner of one eye to the outside corner of the other.